Fire up your grill and get your burgers assembled! Separate ground turkey into 4 even rounds. Divide each round into 2. 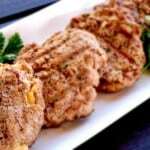 Using 1/2 oz shredded cheese, place the cheese in between each 2 oz of ground turkey. Close patty halves onto one another, pushing the outside together to create an enclosed burger. Heat on your BBQ grill until done (165*F). Cool completely and store for your mid-week burger craving or serve immediately topped with your grilled condiments! Burger nutrition with cheese, no bun included. Add 150 calories and 6+ grams fiber when using 100% whole wheat buns!